This is one of those blog posts which is about something really quite mundane but which might possibly be quite interesting in a decade or three. Maybe. You’ve seen lots of these around. This is a fire hydrant. Or at least, it’s the cover of a hydrant. The bits that actually work are underneath it, and are quite low to the ground. This is also a fire hydrant. I’m assuming it’s an older one, as everything is visible — it doesn’t have a cover. This might be what people think of in their minds when they think of what a fire hydrant looks like. And have you noticed these? I remember being told about them as a kid, I think on an excursion to the (now defunct) Elwood fire station. A blue rectangle on a power pole means there’s a fire hydrant up ahead. A square means it’s back behind you. I’m guessing these make it easier for the fire brigade to find a hydrant (especially at night) when they need it. Update 6/10/2013: Some mention in the comments of blue reflectors (“cats eyes”) on the road to additionally help locate hydrants. For completeness, here’s a photo of one. Next → Next post: How much would it cost to re-write the #Myki software to make it fast as other cities’ smartcards? The difference between a blue rectangle and a square one. I had no idea. Thanks for enlightening us. I’ll bore my fmaily with this next time we’re out travelling. At last I know what those blue triangles and rectangles indicate. Round my way (Brunswick) people are always covering them up with garage sale notices and psoters for gigs. But what is the green rectangular box in your third photo? I’ve never seen a hydrant like your first one, and the second type only in American cartoons. What is the green rectangular box in the third photo? On the street size of the box you will see an ornate logo which I can’t read from the photo. 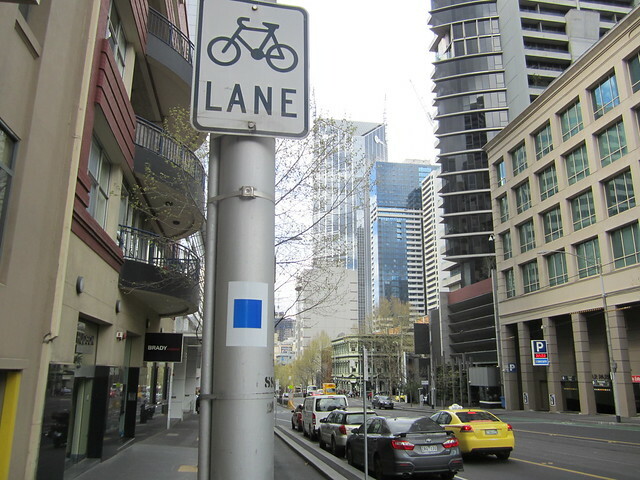 From memory, it is either MMTB (the Melbourne and Metropolitan Tramways Board, the organisation that operated Melbourne’s trams prior to privatisation and Yarra Trams) or MCC (Melbourne City Council which for many years ran the electricity supply in the CBD). Either way, I think it’s something to do with electrical supply. Perhaps Daniel can check next time he goes past the green box. 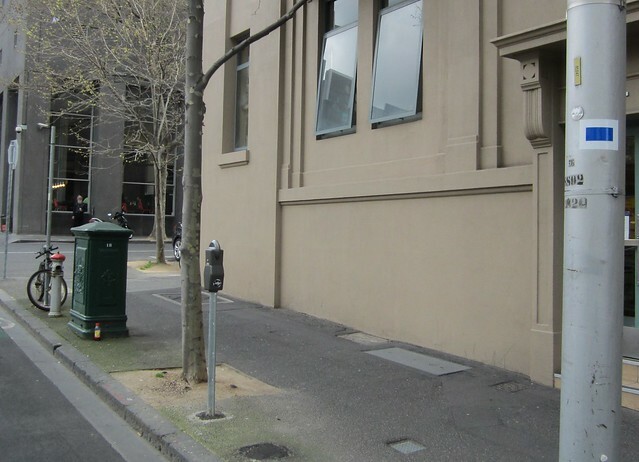 @Fred It’s a ‘Melbourne City Council Electricity Supply Department’ curbside junction box, made of cast iron. I also didn’t know about the square vs rectangle. 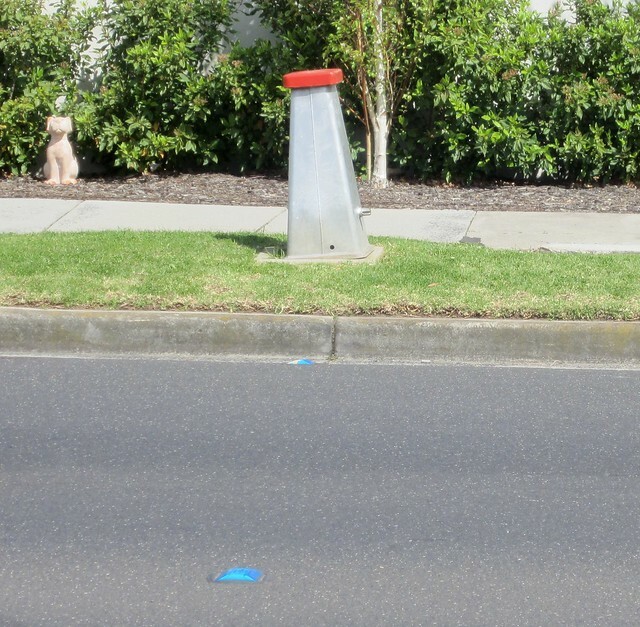 You should also mention the blue reflectors that are also placed out on the road surface. Another type of hydrant are below ground ones, the ones I have seen are below a black circular cover. 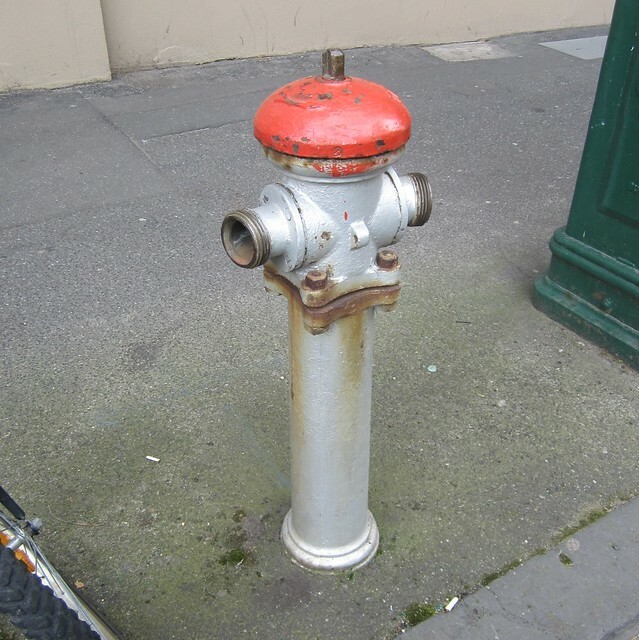 Also, found via Google was “Hydrant guidelines – Country Fire Authority” http://www.cfa.vic.gov.au/fm_files/attachments/Publications/id_streethydrants.pdf which was an interesting read, in particular the explanatory notes. Good to know, but what do they actually do? When does anyone need to access the inside of them? The first type of hydrant is what we call an “L Type”. There are special hose spanners to open the squarish bolt on the side. The second type of hydrant is called a “Milcock”. The come in two varieties: 3 TPI and 5 TPI. (Thread Per Inch). 3 TPI are standard. 5 TPI are found around parts of Geelong. The most common type of hydrant, is the “Ground Ball”. You take the cover off the top, remove the “Red Backs”, scratch the dirt out, then set your “standpipe” hydrant. I’ll take your word for the millcock label – likely as that is what we call the ones associated with a fire station for truck filling purposes and schools etc where they have fire services, but the 3 TPI is in CFA areas (including Geelong) and 5 TPI is an MFB (now MFEB) standard, also used in L types in all areas. The MFEB millcock is very old cast iron, very fragile and breaks at the slghtest touch from a car. New installations of ground balls have a large round plastic cover – a curse to get off in a hurry in the dark. The big aluminium fittings you may see on millcocks are Stortz – the CFA is changing over to this on the hoses, slowly, the MFEB’s already are. Thanks for this. Offhand, I can’t remember whether we have fire hydrants in London (we must do, fires are presumably put out in much the same way everywhere in the world), or what they look like, or where one is. It’s the kind of thing that fades into the background, almost like the red mail boxes that you can never find when you need one but are on every street corner when you dont’. The second hydrant is referred to as a “pillar” type hydrant and came into existence with the expansion of the MMBW’s water network. These are the first type of hydrants and are over 100 years old. Valuable now too for garden purposes. ‘L type’ in the first picture were introduced some time in the late 1960s/early 1970s. Quite a few arround with covers missing and many industrial areas will have a double headed hydrant underneath. I, too grew up in Elwood but moved in 1989 when that fire station closed. Great to see the building still standing and looked after though (Scott Street). Millcock hydrants are a little different to the ‘pillar’ type and have a round handle at the top which you open with both hands. Commonly seen at schools, commercial premises and other places; also behind ‘Fire Hydrant / Hose’ cupboards. 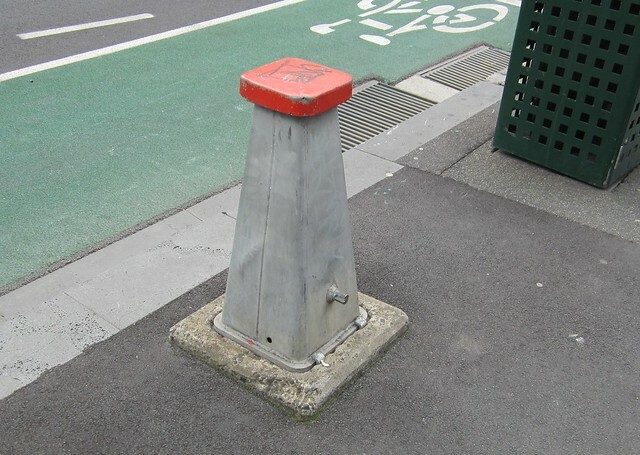 Nice piece of trivial that will make navigating our urban landscape less bewildering. Say what is the standard/legal separation between street fire hydrants? Any one know?